Bit of a cheat on my part this one. For health and safety reasons, I am not allowed to use machinery at guitar school. I jumped out of an aeroplane last week, at 13,000ft, with zero experience but sadly, I cannot even look sideways at a band saw with out getting the H&S crew smashing down my classroom door. 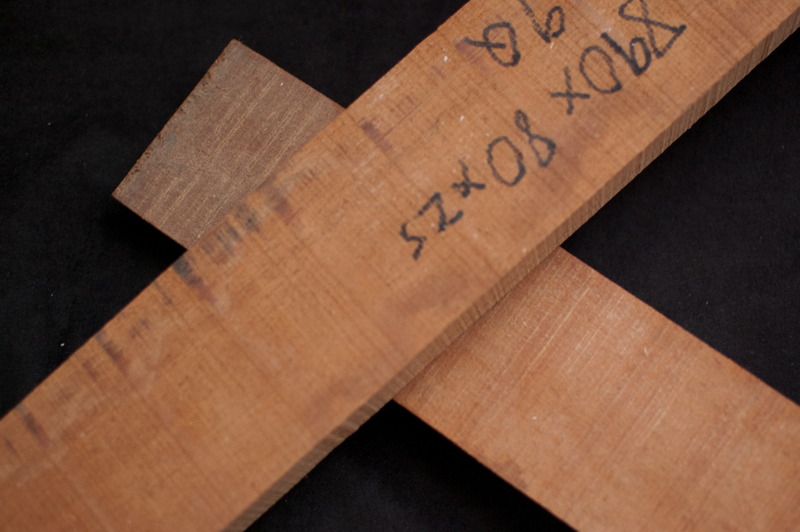 SU uke build : part 05 – Acquiring wood for the neck. Once again I have been incredibly lucky whilst hunting for the parts I need to build the SU. This time my luck was such that I met another electric ukulele builder, and a good chap he is. Peter Howlett builds some very beautiful nylon strung electric ukuleles. He calls them Uklectic, and they are really lovely examples of luthier craftmanship. Peter also runs ukulele building courses and has put lots of good instructional videos up on youtube. I will run an article on them in the next couple of weeks. At £10.99 I couldn’t stop myself reaching for the ‘Buy it now’ button, and actually after some email exchange with Peter, ended up buying 2. Peter says in the description he has more, but at the time of writing, I cannot see any listed in his ebay shop. If you are hunting, you could always try to contact him via his website though. Here is a tricky party of the build. Every steel string electric ukulele I have seen uses a Fender Telecaster style bridge. 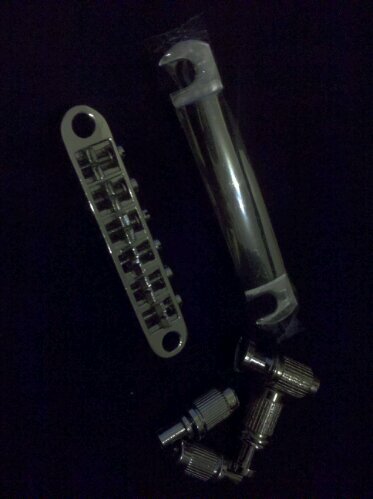 I am build a Gibson style Uke… I want a Gibson SG Tune-a-matic style bridge and tailpiece. Nobody makes them for 4 string instruments. It is fundamental to the design as well. Fenders have straight necks, Gibsons have a slight angle on their necks. It is the way the bridge works that decides which way the neck should be. 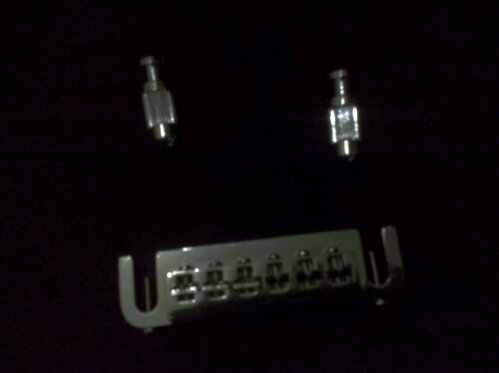 I have bought 2 different types of bridge from Hong Kong using ebay. These were cheapest, I can study their design and draw up my own in CAD and see if I can find somewhere to make me some. Screws and fixings I can reuse from the ones I have bought. 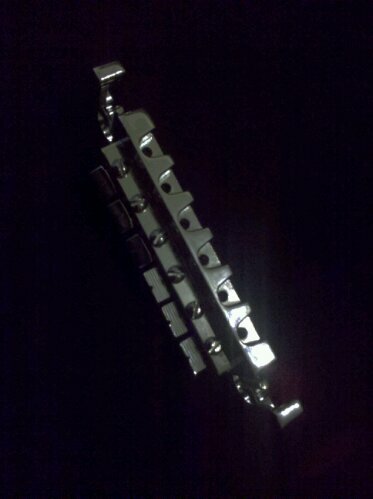 Here they are, the first set of pictures show the traditional 2 piece bridge. 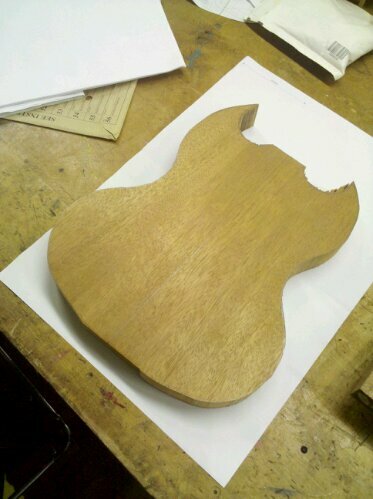 This one looks easiest to replicate, but of course, is 2 pieces and will take up more of the uke body. This next one is a single piece version. 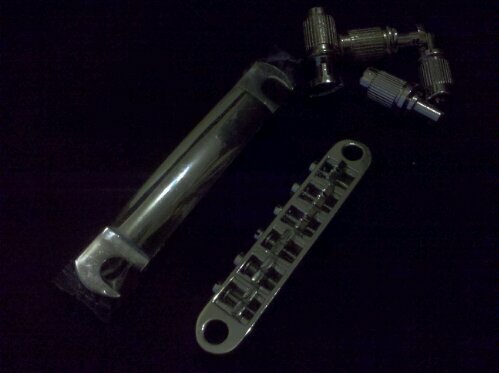 It is more complicated but will save precious space on the face of the uke. I am going to draw up both and send the drawings along with the parts away for machining. After the glue did it’s job, I ended up with a single piece of wood. Ok, it had really small ridges at the joins, but it is definitely a single lump. This is good. I was busy trying to level out the seams with a scraper, when my instructor spotted me. He very quickly jumped in to help me understand how I could get better results. It turns out that a scraper is useless. Unless of course it is backed up with the other relevant equipment. The technique seems easy enough but it makes a huge difference for sure. I am sure it applies just as well to other tools that you need to make sharp. I was thinking how best to describe what I had learnt, when I came across this guide to sharpening and using a scraper at www.stewmac.com. 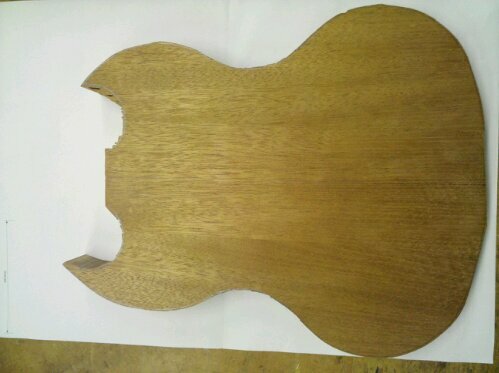 Now my mahogany body is glass smooth and looking nice. You can still see the holes from where it was salvaged, but you will note these are around the edges and will be removed. Next up, I will be drawing on a template pattern and cutting the block to shape. Gibson SG’s generally have a solid mahogany body and neck, so it seemed logical to use mahogany for the SU’s body as well. 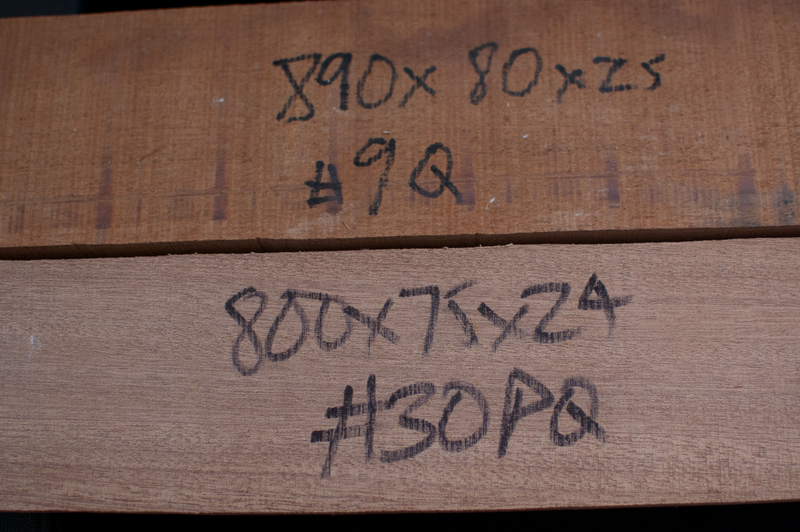 The trouble is, mahogany is expensive stuff. 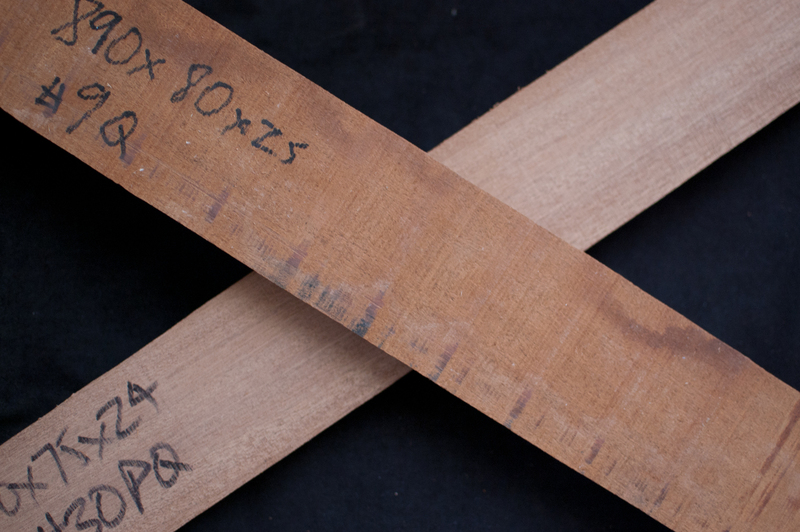 At the time I am writing this, a electric guitar blank in mahogany turns in at around £60. Yikes. 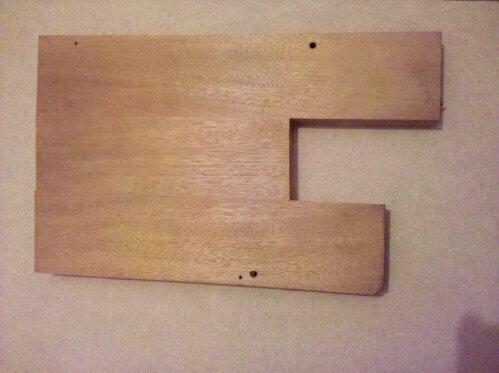 I was lucky, as a kind gent on my luthier course had some ‘scrap’ mahogany that he gifted me (thanks Tony). 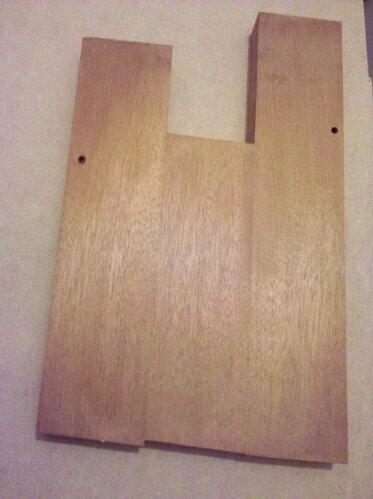 It came as a single plank, and it had a few holes in it. The ends even had some broken screws in them, but with some careful selection cuts and joins, these bits will all end up in the waste bin. As I had already drawn up plans, I knew the dimensions and which areas I could afford to have the waste holes in. 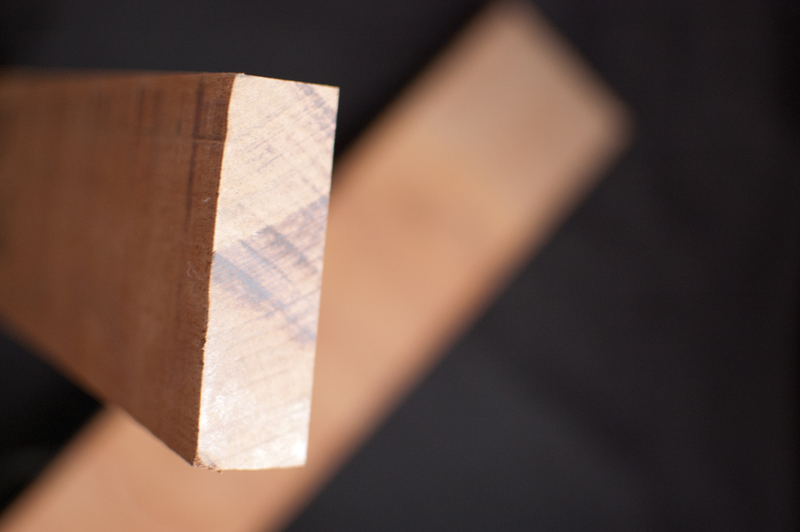 I sawed the plank into three parts, which my instructor, Mike, took away to machine plane for me, as we don’t have access to machinery at the college. 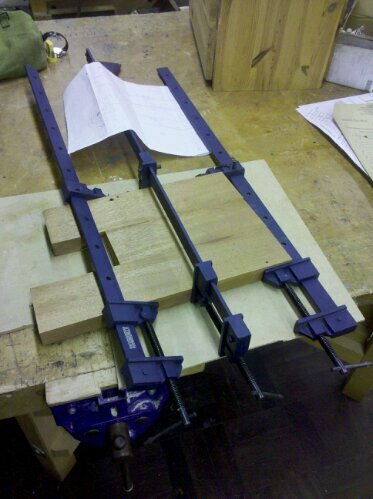 A week later, the 3 flat pieces where back with me and I proceeded to glue them together and clamp them up tight. The clamps are known as Bar Clamps, and they helped pull the three pieces of wood together. I had some cheap metal scrappers that I picked up in a discount pound shop that I used to remove the excess glue that seeped out. 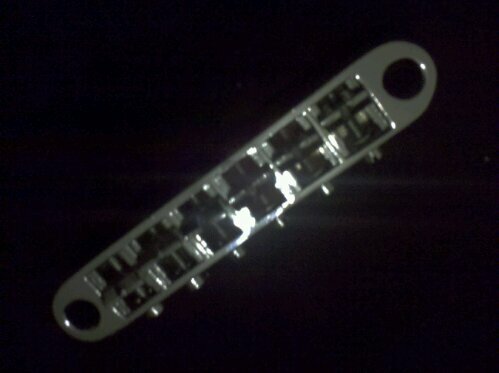 Next time, I will show you how the ‘body’ looked after I removed from the clamps, and go through what happened next. 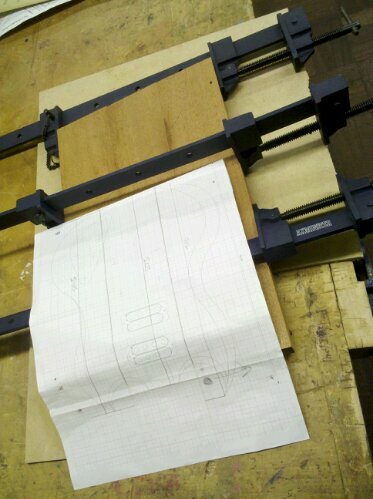 Another ukulele build under way. Once again, I feel getting the plans right before embarking on cutting wood is really important. So many charectaristics of the build need to be considered. Gibsons SG guitar is an iconic guitar played by the likes of AC/DC’s Angus Young and Black Sabbath’s Tonni Iomi. It is a solid guitar (hence SG) made from mahogany, with twin humbuckers. My version is obviously a Solid Ukulele and therefore SU. I have not seen anything quite like what I was looking for in this SU. There are electric ukes out there that are styled like Gibson Les Paul’s and they look really good too, but they don’t seem to truely embrace the Gibson design totally. For instance, there is a German company called Risa who make lovely looking Les Paul style ukes. 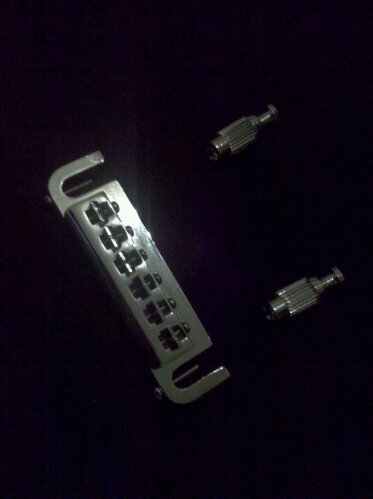 While they do have both neck and bridge humbuckers and 2+2 opposing machine heads, the bridge looks like a Fender bridge. I really want to maintain the Gibson look and feel, so for my build, I am going to have to look for Gibson style bridges. For the body shape, I took some SG pictures I found on google and traced them (in software), and scaled the outline down to ukulele size. This one is going to be a tenor scale uke, purely because tenors fit my finger size better, and it gives more playable frets. The gaps at the high end of the neck on sopranos and concert style ukes are mostly too small for my fingers and therfore unplayable for me. At this stage I am not sure about how to tune it though. As I have already decided to go Tenor to give more high end space, it seems logical to use a low ‘G’. Tenors can be either tuned to re-entrant gCEA or have a sequential GCEA tuning. Smaller ukes such as sopranos are typically all gCEA, where the ‘g’ string is one octave higher, or to put it another way, 2 semitones lower than the high ‘A’ string. Having said all that, I have never played a low ‘G’ tuned uke and may change my mind if it does not sit right. I think low ‘G’ will give a more rock sound though. Pickups are another important thing to consider. 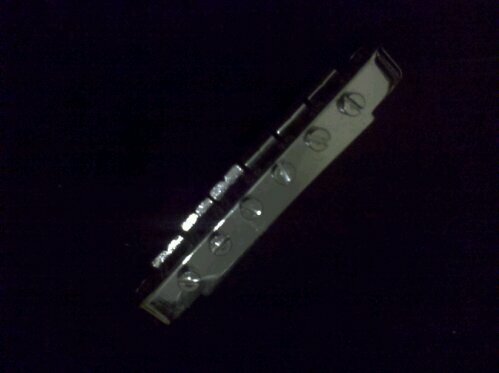 On the Tearcaster build, I thought just one single coil pickup is enough. The simplistic build. For this SU build, 2 pairs of humbuckers are the order of the day.